I’ve had to do frequent prep-rally talks with Lucas about wearing his costume for Halloween. I believe I have mentioned about how Lucas is still in his summertime phase of shorts and shirts. Getting a sweater, jacket and socks on him leads to throwing fits. So, wearing a Halloween costume has been a little unbearable. He refused to wear it to our ward Halloween party. So, I’ve said no costume, no candy. 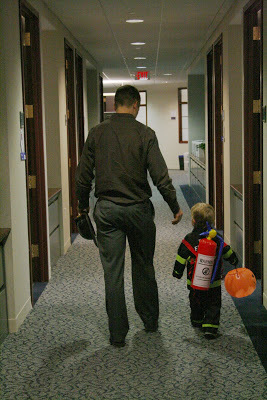 All last week I was prepping him for Daddy’s work Halloween party. Lucas was pretty excited to go, and just getting to see Daddy and hang out with him is a treat in itself. But I told him if you aren’t going to wear your costume, we aren’t going and you aren’t going to get any candy. He understood and he wore it. Even the little fire extinguisher. No fireman hat–that’s a whole other prep-rally. But he sure is a cute little fireman. The post No Costume, No Candy appeared first on Darling Darleen | A Lifestyle Design Blog .